Linus "LLinusLLove" Loeliger takes over the top spot for most profit in 2018. On March 1st, registration opened up for the 2018 Super High Roller Bowl at the ARIA Resort & Casino. Interested players are required to pony-up a $30,000 non-refundable deposit in order to be eligible to play in the $300,000 buy-in event. Thirty players will be selected via a lottery process to join 18 VIP guests who have spots reserved by ARIA, making it a 48-player field. Last year, the initial registration sold out in just seven hours with the raffle for seats taking place soon after. As has been the case each year since the Super High Roller Bowl launched in 2015, this year's event from May 27-30 will once again be rake-free and attract some of poker's biggest names along with businessmen and other wealthy non-pros. Unless more seats are made available – as was the case last year when the event was expanded from 50 to 56 entrants – the prize pool will be topped off at a smashing $14.4 million. A spicy $5 million dollar slice of that is slated for the eventual champion. The winner will join the elusive club of past Super High Roller Bowl winners including Christoph Vogelsang, who is the defending champion after winning last year's event. 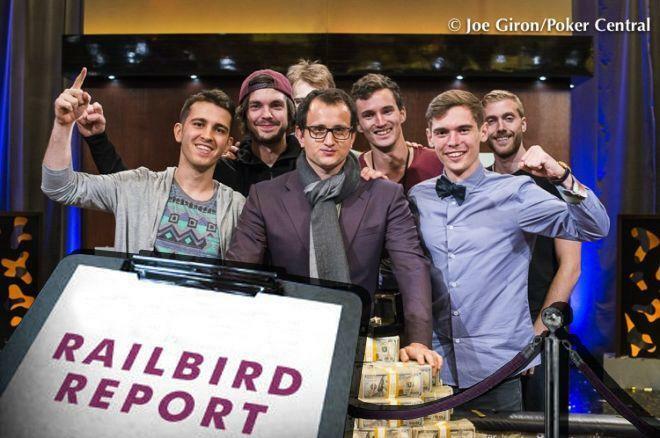 The other former winners are Brian Rast, who won the inaugural event back in 2015, and Rainer Kempe, who outlasted a field of 49 players to win the 2016 Super High Roller Bowl. Timofey "Trueteller" Kuznetsov was involved in two of the three biggest pots since the last Railbird Report two weeks ago. Rui "PepperoniF" Cao was on the losing end of the top two biggest pots. The big pots don't tell the entire story, as Kuznetsov was one of the biggest losers during the period reporting a loss of $39,288 while Cao reported a profit of $62,010. All of the three biggest pots took place on no-limit hold'em tables during the last week of February. Timofey "Trueteller" Kuznetsov opened to $450 from the hijack and was called by Jordi "prot0" Urlings on the button before Cao three-bet to $2,400 from the small blind. Kuznetsov four-bet to $6,700 and Cao moved in for $56,865 after Urlings folded. Kuznetsov, who was well-covered with $38,526 behind, called. In a classic race situation with Kuznetsov marginally ahead, the duo agreed to run the board twice. Cao bricked both times. His hand failed to improve when the appeared on the first board. It wasn't looking good for Cao on the second board needing a pair of runners for a straight after a queen gave his opponent a set on the flop. Although the on the turn gave Cao a pair, he was already drawing dead and after the appeared on the river, the entire $91,102 pot was shipped to Kuznetsov. The action began with Cao raising to $500 from under the gun. Luke "Bit2Easy" Reeves three-bet to $1,700 before he called a four-bet from his opponent of $4,600. The action heated up even further on the flop. Cao led out for $3,800 before Reeves raised to $10,200. 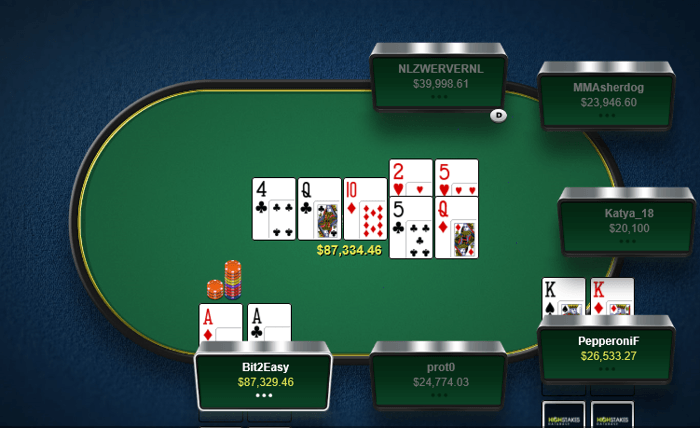 Cao then jammed all in, well covering the $28,717 remaining in his opponent's stack, and Reeves called. Cao's pocket kings were dominated by the pocket aces held by Reeves and the duo ran it twice. Cao was unable to get their either time with the and completing the first board and the and to complete the second board, sending the entire $87,334 pot to Reeves. 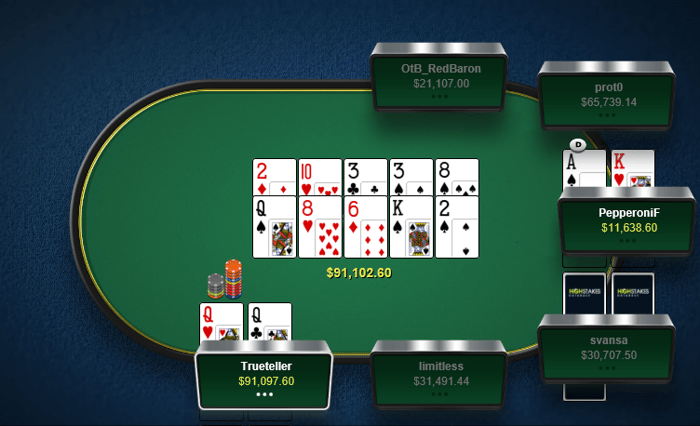 With three players at the table, "Otb_RedBaron" opened to $950 from the button. 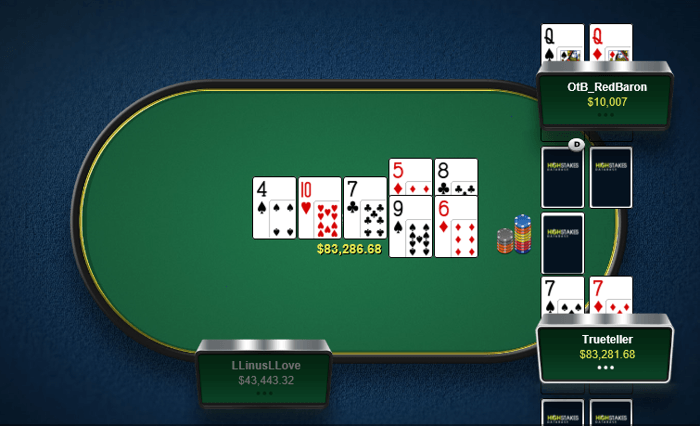 Kuznetsov three-bet to $4,400 from the small blind and Linus "LLinusLLove" Loeliger folded from the big blind. "Otb_RedBaron" four-bet to $9,600 and Kuznetsov called. Kuznetsov check-raised to $12,800 on the flop after "Otb_RedBaron" bet $5,879. "Otb_RedBaron" jammed all in, effectively covering his opponent's remaining stack of $19,043, and Kuznetsov called. "Otb_RedBaron" was well behind Kuznetsov's set and only had two outs to save him. The duo agreed to run it twice, but a queen didn't appear on either board. Kuznetsov won the third biggest pot of the week of $83,286 after the and completed the first board and the and completed the second. Thanks to a couple of strong weeks, Linus "LLinusLLove" Loeliger overtook Alexander "joiso" Kostritsyn on the 2018 overall leaderboard with $353,094 profit in the past few weeks. Loeliger is now banging on the door of $1 million in profit lifetime at PokerStars. Kostritsyn and "JayP-AA" both did not play the past two weeks but remain in the top three spots on the 2018 leaderboard with $324,245 and $257,203 in profits respectfully. "ImagineKing" remained firmly entrenched as the year's biggest loser in 2018 thus far with $653,428 in losses. Both Mikael "ChaoRen160" Thuritz and Elior "Crazy Elior" Sion did not play during the past two weeks and remained as the second and third biggest losers of the year. The above top winning and losing players in online poker for 2018 only takes PokerStars accounts into consideration. All public data courtesy of HighStakesDB.com. If you want to opt out of being listed in this PokerNews update on high-stakes action, send an email with your username to jason.glatzer@pokernews.com.